The projected costs of building a new bus station and connected leisure centre in Exeter have soared by 30% to £52m. If the scheme is to go-ahead as planned, Exeter city council will have to back plans to find £12m of extra funding at a forthcoming key council meeting. But the option is also on the table to scrap the plan. Plans for the new bus station appear to shunt it to one small corner of the new development complex. As is normal when bus station sites are developed the bus station plays a minor role compared to other buildings on the site. Kier is preferred contractor to deliver the scheme, which has seen the projected building budget rise due to construction cost inflation, cladding and site access challenges. The project forms the centrepiece of a new £300m city centre vision from the council, which will also see housing, offices, restaurants and retail, as well as the possibility of a new multi-use entertainment venue. Details of the vision, which also includes the potential to relocate the civic centre to the site to free up space for much-needed new housing, will be discussed at the council’s Leisure Complex and Bus Station Programme Board. 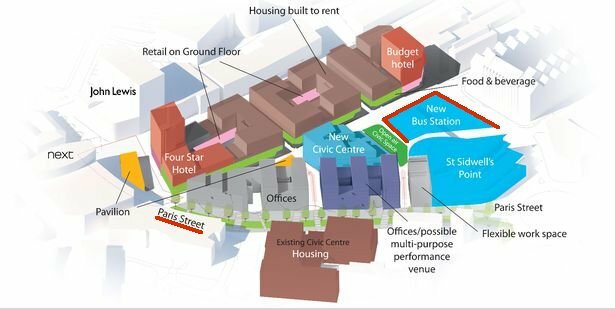 The existing Exeter bus station is located on a prime site and urgently needs re-development. Chief Executive and Growth Director Karime Hassan said: “The development concept provides a mix of uses that will complement the High Street, supporting both the daytime and night time economy, and responds to the demand for housing and offices within the city centre. A report for councillors revealed the previously approved budget to build the leisure complex and new bus station would need to increase to deliver the flagship project in the new vision for the wider area. Councillors will be told additional funding could be achieved without negatively impacting on the medium term financial plan, and would not increase the council’s already identified saving requirements and commitments over the coming years. This would be achieved through income from the leisure centre operator and financial management measures, including restructuring of council-wide repayments of debt.